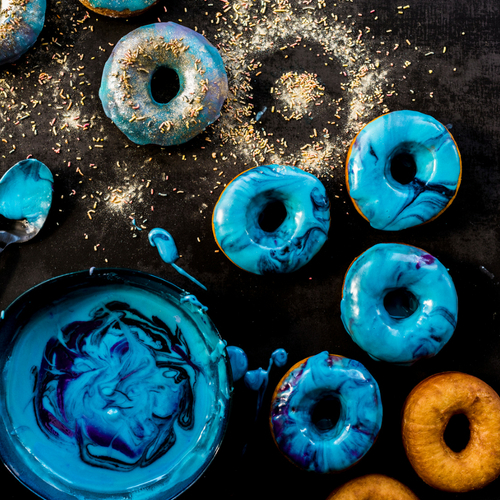 Our doughnuts are out of this world. A soft fluffy doughnut marbled with glazed icing. You won’t go wrong with this recipe. 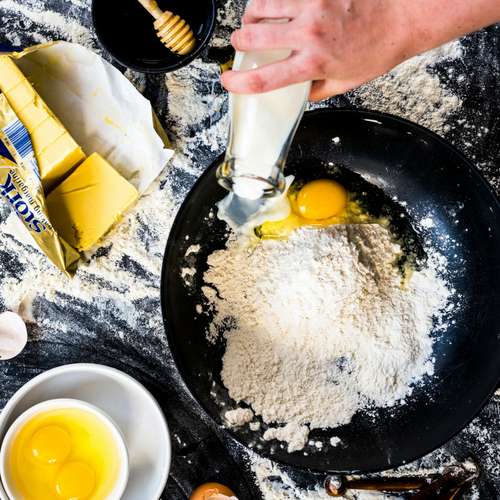 Place the milk and yeast in the bowl of a mixer and stir to dissolve. Add the eggs, yolks, flour, butter, sugar, honey and salt. Using a dough hook or your hands, knead the dough for 8-10 minutes or until a soft, smooth dough forms. Cover with clingfilm and allow to rise in a warm place until puffy and doubled in size. Knock the air out of the dough by kneading it gently then roll out on a lightly floured surface until 1 cm thick. Using a 7cm round cutter (or drinking glass) cut out rounds from the dough, then cut out a smaller hole from the middle (the back of a large piping nozzle works well). Place the doughnuts on a floured baking tray and cover with greased clingfilm. Prove in a warm place until doubled in size and puffy. 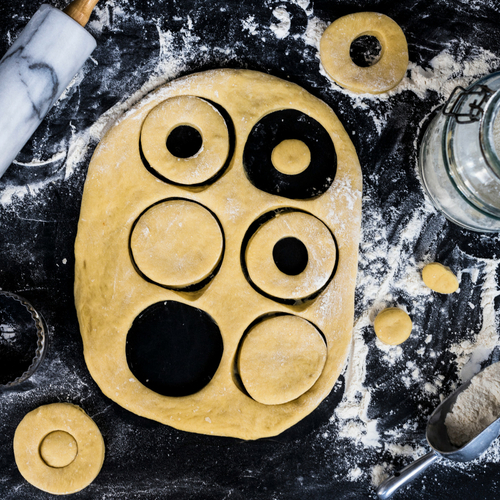 Preheat the oil to 180 degrees celsius (or when a cube of bread dropped into the oil turns brown in 10 seconds) and place the doughnuts upside down in the hot oil. Fry on one side for 1-2 minutes or until golden brown, then flip over and cook the other side. Remove from the oil and drain on kitchen towel. Allow to cool. To make the glaze, whisk the icing sugar, lemon juice and enough hot water together to form a paste. Divide the frosting in 3 (or however many colours you want), then tint each batch a different colour. Spoon a little of each colour frosting in a separate bowl (large enough to fit your doughnuts), then dip the tops in. Allow the excess to drip off then set on a cooling rack. 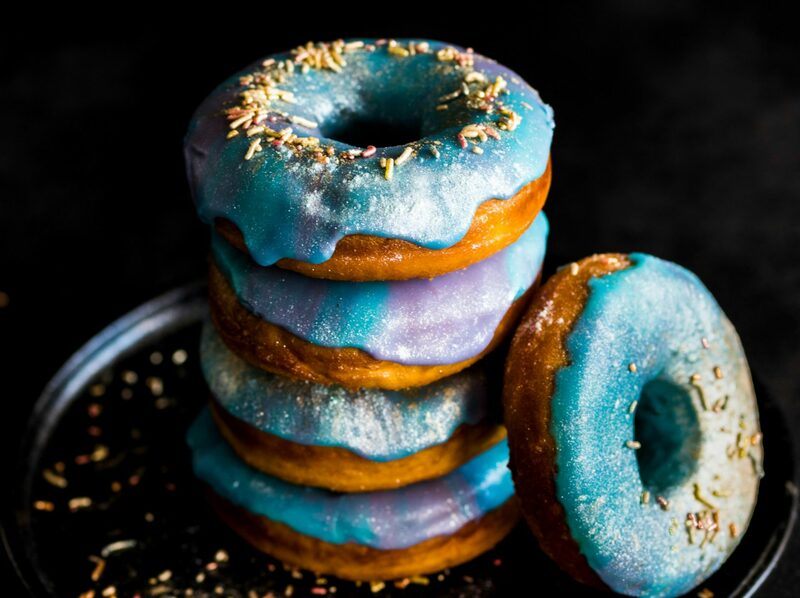 Repeat with the remaining doughnuts then finish with a sprinkle of edible glitter and sprinkles, if desired.